There are many auto shop software systems designed for automotive service dispatch. But manual, hand-written daily appointment books, service appointment pads, job tracking books, dispatch numbers and route sheets are frequently still the most effective way for your service advisor to keep the auto repair shop organized. A service advisor must control a dispatching system that gives customers a realistic idea of how much time the repairs will need, keeps the workflow in the repair shop smooth, maximizes technician job assignments and keeps track of parts requirements. Estampe offers a wide range of auto dealer supplies for automotive service dispatch, scheduling and service routing that can make your service writer's and advisor's job easier. A high quality, well run appointment scheduling system for your service department is not only good for increasing productivity, but also adds positively to the reputation of the entire dealership. 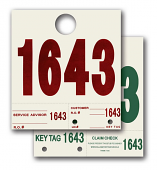 These Daily Service Route Sheets are an ideal way to schedule and track for the service department. The sheets are 12" x 15", print in Blue ink and come with a spiral bound cover. 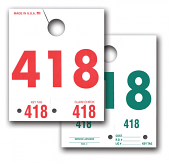 These sheets are also heavy duty tag stock with two different sizes of posting holes.